EWF Elizabeth Lauren Perry informs me that the January 1999 issue of Lighting Dimensions magazine contains a great article that explores the lighting design and techniques used for the Plugged '98 concert tour. It includes some great photos and some very interesting, although technical, info. 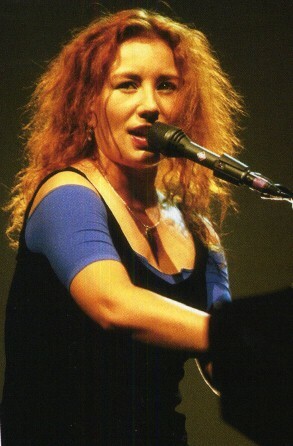 The article is called "Plugging In: On Her Latest Tour, Tori Amos Brings Along A Rock Band - And A More Amplififed Look." Read the article below. Elizabeth has also scanned the photos for me as well. They are below...click on any photo to see it much larger! You can also read this article online and see the photos at the Lighting Dimensions web site. Plugging In: On Her Latest Tour, Tori Amos Brings Along A Rock Band - And A More Amplified Look. Marrying Mark Hawley, her sound engineer, may have had a little something to do with it. Because when Tori Amos began recording her latest release, From The Choirgirl Hotel, the famously confessional songwriter decided to eschew working solo and instead surrounded herself, and her piano, with a rock band. Even when passionately pounding her piano and singing about masturbation, rejection, or jealousy, Amos has always projected and intimate rather than in-your-face vibe, and LD Simon Sidi's stage lighting has subtly accuentated her style. But having recorded the album with the band, naturally she also took them with her on tour, which allowed her long time LD to come up with a broader visual interpretation of her music than he had done in the past. 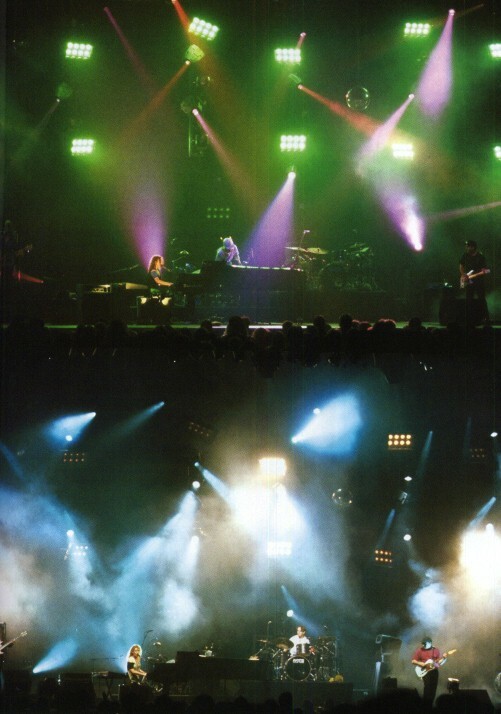 Sidi managed to light Amos' 1994 tour with only seven Icon luminaires from Light & Sound Design; in 1996, video was added, but the number of lamps grew only slightly. This time out, the lighting rig is as big as any rock show on tour. Amos introduced her audiences to her new material and the band in a flurry of US club dates last spring, then went off to do the same in Europe. When the tour returned to the US in the summer, arenas and ampitheatres were on the agenda. Sidi brought out the big looks on the club tour, and simply built on his original design for the larger venues. "It's almost exactly the same design as the club tour, except it's bigger," Sidi says. "When it was just Tori onstage, I always had to keep in mind the noise factor of the lights. But with the band, that's no problem. LSD's Barry Claxton sent out Dan Boland to help Sidi program the Icon Console and the pair spent a week putting the looks together during production rehersals in Milwaukee. "Poor Dan had never met me before and he had to program every little detail to the nth degree, because I'd just done a six month tour and knew everything absolutely perfectly," Sidi says. "Although this was the big rig and it was in its third phase, I wanted to have the same kind of looks, only bigger." One major change Sidi did make was to switch our the WashLights for High End Systems Studio Colors. "I'm really glad I did that - not only are they brighter but they also have a great strobe in them and nice colors. I was very pleased with them." Boland concurs. "The Studio Color's random strobing feature is amazing," he says. "To control the Studio Colors from the Icon Console we run it through the Universal Guest Luminaire Interface, the UGLI, so the shop faxed me some info on where it fits into the "select" panel on the Icon Console. They had from 1 to 100 in the shutter function. From 1 to 25 is strobing all together, then 25-90 is this random strobe. So we brought up at 50%, and they came up. One of the best examples is 'Raspberry Swirl.' The song has magenta and a light green as the base colors, with the Studio Colors strobing at random. During the song I'll select different colors and bring them up, and all the kids scream and dance. It's a great effect." After a few weeks, Sidi left the tour to go out with Depeche Mode, leaving the lighting in Boland's hands. "Dan is doing a wonderful job," Sidi says. "It's weird working with operators when you're used to doing it yourself. His timing was not brilliant at the beginning - there are certain cues that work on weird timings and he couldn't get his head around them, but I can hardly blame him. It would take me forever as well if I didn't know the material. I'd say it took him about two weeks, but when he got it, it was perfect." "When the tour first started, I couldn't get the smoke right," Boland agrees. "Simon likes to use smoke as a cue, and I've seen it done before, but it never clicked in my head. One time he actually taped the pedal to my foot and said, 'Remember to step. Right here, remember to step.' And I still couldn't get it. But it was early in the tour, and I thought as time went on, I'd get it. And I have. Simon was good to work with. He really had some clear ideas, and I liked a lot of what he did." The four High End Systems F-100 foggers are controlled by the foot pedal, and additional Reel EFX DF-50 hazers are run manually backstage. Instead of spotlights, the designers have set up a series of key lights. "There is a series of six PAR can bars, four of which are dedicated to each of the different band membres with an open white, a congo blue, and a rose color," Boland explains. "I have them set on the matrix panel so I can key it as I need it. If we play a large arena and she's further away, we need to boost the lights so people can see her, whereas if we're playing in a smaller venue or theatre , I can just let the key Icon and the key Studio Color light her, and back off on all that. It's fun in that way." Since Amos is known to change her set list on impulse, the LD has found the rig's flexibility to be an asset. "It's a really good design to work from," Boland says. "The vertical towers put the lights at different levels, and I've been able to take the middle section of lights and use it at the beginning of a song, then draw from the floor and later from the top of the rig, and vary it that way." "While I was a bit skeptical about the Studio Colors at first, I've been pretty impressed with them," he continues. "Besides the strobe, they have a lot of different features and I find that when I get stuck in the middle of designing a song, I can go to them for different looks. Because I'm with LSD, I know what the Icon is capable of, so that's usually the light I start with when I'm designing." The automated luminaries form the basis of most of the songs' looks and the conventional lights are used more for effects. "Besides the moving lights, we have the DP Flood Lights and the 8-cell Molefays, which are great and can do a lot," Boland explains. "Simon used them heavily in his initial design, but I've tried to back away from it a little so that when she starts mixing up the set list with the songs that he's done and the ones that I've done, the audience isn't constantly being barraged by Molefays. Of course, she always mixes up her sets, so there are some days where the first five songs are all Molefay songs, then the last five are more atmospheric." Regrettably, one of the show's more whimsical atmospheric effects was pulled off the show. "We originally had 15 bubble machines and there was a list of songs that we'd use them for, if she played them in the set," Boland says. "After a while, the bubbles were landing in the piano and rusting the strings, so production decided that rather than continue to sacrifice the piano strings, it would be better to take the one gag out." The show does still have its bubbly moments. The bubble machines were in full force when the tour first raveled up the East Coast, and when it swung back to that part of the country last fall, the audiences took up the slack. "We played close enough to some of the other venues we'd seen before, so the kids were coming back - and they were all blowing bubbles," Boland says. "They definitely picked up on that." Boland has also changed the rig to fit each venue. "Because we've gone from arenas down to small theatres, I've made small adjustments as we've gone on," says the LD. "Tori has roughly been doing a new song every week; it all depends on how quickly the band gets it all jelled together. When she initially does a song, she'll call me up onstage during sound checks, and she'll tell me what it's about to her, why she wrote it. Every now and then she'll have ideas of what color she wants or what she'd like to see. It's actually quite funny. She came out front-of-house to sit down and listen to her CD, because we were going to do a new song, 'Girl,' from her first album. I was running cues, and then I hit 'home,' which sends all the lights to open white, and she just jumped up and insisited that we use that in the song. I explained that it's just the open white cue; it brings all the lights to a home position to start from. But she loved it, so we put that in. "She has a good idea of what she wants, and I try to get what she wants," Boland continues. "I would often have my doubts when she would ask for certain looks, but I'd always give it a show to see how it looked and 90% of the time she was right." By the time the tour ended on December 3, Boland had gained a lot of valuable experience. "This was the first tour that I had as much free rein as I did, and I received a lot of positive feedback from [tour manager] John Witherspoon and [production manager] Andy Soloman. I went to see her in concert during her first tour, and was very impressed with her then. It's always great to have the opportunity to work with somebody whose music you enjoy. Plus, we have such a great crew - most of them have been with her for a long time. It's kind of a family type of vibe, and I've really enjoyed it."